The past few years have been nothing less than a roller-coaster ride for the co-founder and executive pastry chef of Lavonne Academy of Baking Science and Pastry Arts. 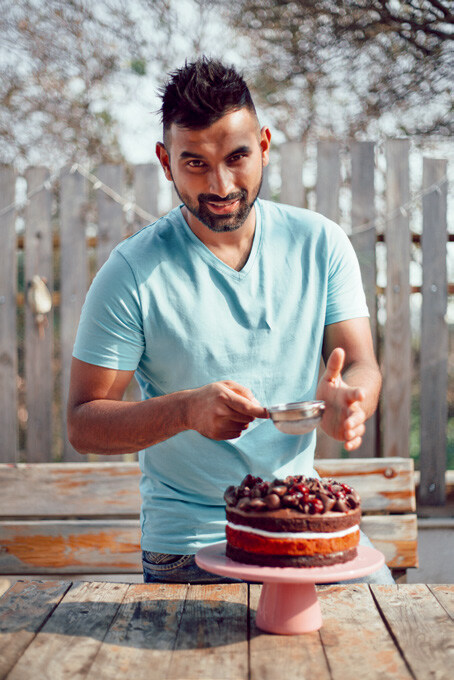 One of the two Indians on a major business magazine’s list of young Asian achievers in the Arts, Vinesh Johny has hosted internationally renowned pastry chefs like Kelvin Chua and Nina Tarasova at his school. I have come to understand the importance of genuinely caring about each student’s personal progress….It’s also extremely critical to remain a great performer and storyteller to ensure that I constantly have the students’ attention to unify them towards the common goal of pastry education. Breakfast has always been my favourite meal of the day. Be it at Lavonne or at home, I love to bake viennoiseries (breakfast pastries). From diﬀerent kinds of croissants, breads, brioche, French toasts and pain au chocolats to eggs and other savoury dishes, I love indulging myself in baking and eating it too! As a kid, whenever my father took us to the local ice cream parlour, our all-time favourite was the chocolate sundae. Although a simple dessert, it brings back fond memories. Technique always comes first. Once you’ve perfected it, you can be sure that the flavour and aesthetics will fall into place too. Apart from this, it’s imperative that we pay attention to texture and temperature. It is often taken for granted, but it is extremely critical to serve any dessert at its right temperature. Publishing my own guide for professional baking, opening a self-sustainable culinary/pastry school of my dreams, and doing the Everest skydive.